Finding a decent iPhone to video converter can be a pain, and finding one that the average person finds easy to use can be even worse. 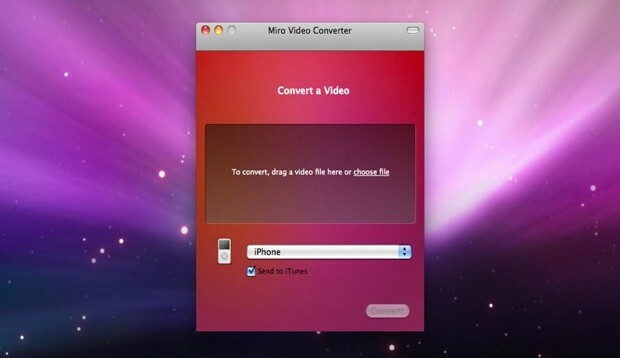 Thankfully along with the Mac App Store came Miro Video Converter, a practically foolproof and no frills video conversion utility that can convert just about any video file into an iPhone compatible format with the click of a button. The conversion is surprisingly quick, and the newly converted video file will appear in the same directory that the original source video was located. If you chose “Apple Universal” you’ll now have a MP4 file that can be brought onto your iPhone (or iPad, iPod touch, etc) and played hassle free. The downside to apps like Miro is that the simplification takes away more advanced options that some users require. In that case and you want more control over the conversion and video quality, check out converting video to iOS formats with Handbrake. It’s also free to download and pretty easy to use, but has significantly more options like bitrate, frame rate, subtitle support, and more. Update: Several commenters have suggested using Evom, which is a great utility we have discussed before in the context of converting web videos to Mp3, it is also free. Not to nitpick, but this is an iOS video converter for all iOS hardware, not just iPhone. Anyway, Miro is OK and I downloaded it when it was in the Top 10 list, but I ended up going back to Handbrake for hardcoding subtitles. Tried it. Evom is better. It’s also free, and can convert just about any video file to just about any other video file and back again. Shame that of all the Apple-based options it doesn’t have one for Apple TV. Good one, but as easy as Miro I advise “RoadMovie”. Miro is supposed to work on OS X 10.5 or later. I run 10.5.8 on my iMac. Is this Miro or other video format convertor available other than through Mac App Store? The reason I ask, is that you have to have Snow Leopard or later to use the Mac App Store. I prefer Evom for quick drag/drop. Handbrake is for serious conversions. This is OK though, I will recommend it to my novice friends.